Paul Harvey Aurandt (September 4, 1918 – February 28, 2009), was born in Tulsa, Oklahoma, and became internationally recognized as Paul Harvey, an American radio broadcaster for the ABC Radio Networks. He and his wife, Lynne (whom Harvey called Angel), lived in River Forest. Harvey broadcast News and Comment on weekday mornings and mid-days, and at noon on Saturdays, as well as his famous The Rest of the Story segments. His listening audience was estimated, at its peak, at 24 million people a week. 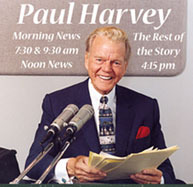 Paul Harvey News was carried on 1,200 radio stations, 400 Armed Forces Network stations and 300 newspapers. He was known for catch phrases he used at the beginning of his programs, such as "Hello Americans, I'm Paul Harvey. You know what the news is, in a minute, you're going to hear ... the rest of the story." He always ended, "Paul Harvey ... Good day." The son of a policeman, Harvey made radio receivers as a young boy. While attending the University of Tulsa, he worked at KVOO, first as an announcer, and later as a program director. In 1940, Harvey married Lynne Cooper of St. Louis, and in 1945, the couple moved to Chicago, where he was broadcasting from the ABC affiliate WENR. On April 1, 1951, the ABC Radio Network debuted Paul Harvey News and Comment "Commentary and analysis of Paul Harvey each weekday at 12 Noon". On May 10, 1976, ABC Radio Networks premiered The Rest of the Story as a separate series which provided surprises as Harvey dug into stories behind the stories of famous events and people. Harvey's son, Paul Harvey, Jr. created and produced the series, and was the show's only writer. Harvey did not host the show full-time after April 2008, when he came down with pneumonia. Shortly after his recovery, Lynne died on May 3, causing him to prolong his time away from broadcasting. The Chicago Sun-Times described her as, "More than his astute business partner and producer, she also was a pioneer for women in radio and an influential figure in her own right for decades." Lynne Harvey was the first producer ever inducted into the Radio Hall of Fame, and had developed some of her husband's best-known features, such as "The Rest of the Story." While working at CBS, she was among the first women to produce an entire newscast. In later years, she was best known as a philanthropist. Harvey was named Salesman of the Year, Commentator of the Year, Person of the Year, Father of the Year, and American of the Year. He was elected to the National Association of Broadcasters Radio Hall of Fame and Oklahoma Hall of Fame, and appeared on the Gallup poll list of America's most admired men. In addition he received 11 Freedom Foundation Awards as well as the Horatio Alger Award. Paul Harvey was named to the DeMolay Hall of Fame, a Masonic youth organization, on June 25, 1993. In 2005, he was awarded the Presidential Medal of Freedom, the United States' most prestigious civilian award, by President George W. Bush. Harvey died on February 28, 2009, at the age of 90 in Phoenix, Arizona.